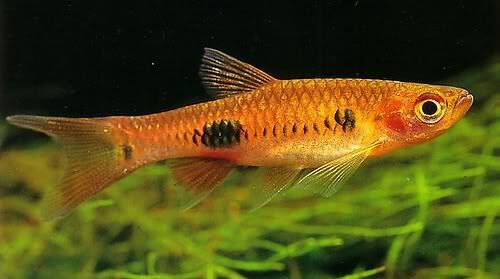 Rasboras the perfect community fish, are a genus of a small group of minnow type fish that belong to the Cyprinidae (carp) family. They are found in parts of Southeast Asia; Singapore, Sumatra, Malaysia, and South Thailand as well as parts of Africa. 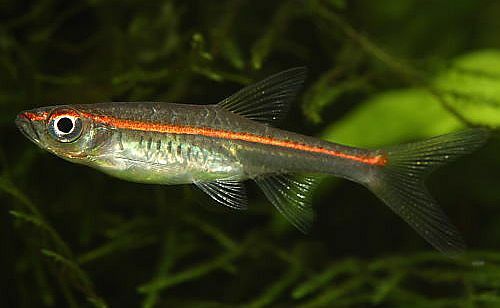 Currently the genus Rasbora contains over 83 recognized species which are listed below. 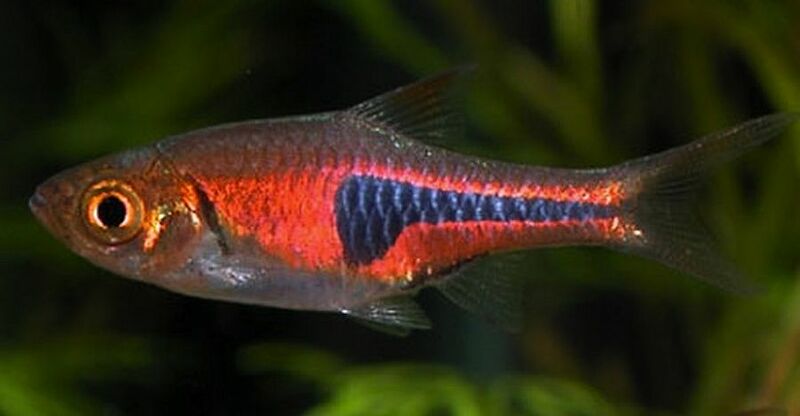 Tropical fish from genera such as Boraras, Microrasbora, and Trigonostigma are commonly called rasboras by tropical fish keeping enthsiasts, but are not members of the Rasbora genus. 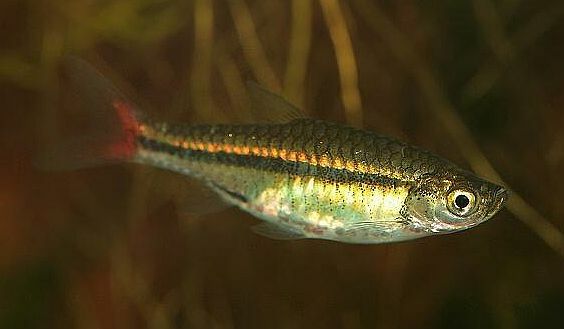 The genera Boraras and Trignonstigma were split from Rasbora leaving the genus Rasbora (found in Southeast Asia and Africa) the largest. Most rasboras are small, under 4 inches long, and several of the species are commonly kept in community aquariums. In many ways rasboras are the perfect community fish. They are peaceful, elegant looking, active, easy to maintain and easy to breed. Many species are beautiful but underrated and often overlooked by tropical fish keeping enthusiasts. Rasboras typically inhabit streams and slow moving waterways in peat swamp forests which characteristically have low mineral content and high concentrations of humic acids. The water logged forest soil retards the complete decay of leaf litter with results in the formation of the peat. The resulting “black water” is created as the peat leaches humic acids and related compounds into the water. These conditions are found in Southeast Asia and some areas in Africa and can be mimicked in an aquarium environment by the use of peat bags . Rasboras are a popular family that includes Koi, goldfish, barbs, danios, labeo (sharks) and several other favorite species familiar to tropical fish keeping enthusiasts. 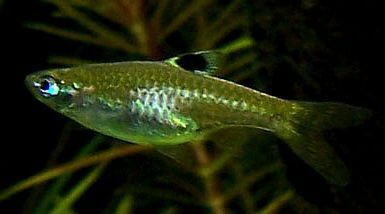 Some rasboras are streamlined like minnows, while others are deep bodied. 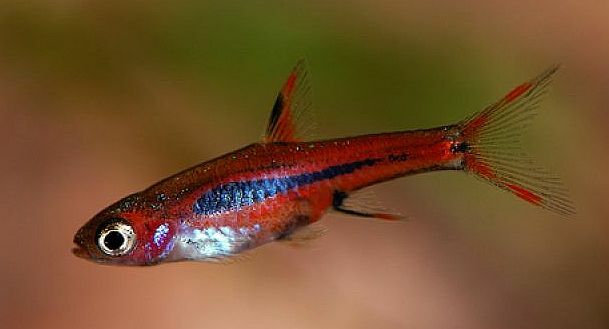 Many rasboras are adorned with prominent markings and attractive coloration, while others are more subtly marked with little to no coloration making them less desirable and thus unavailable to hobbyists. 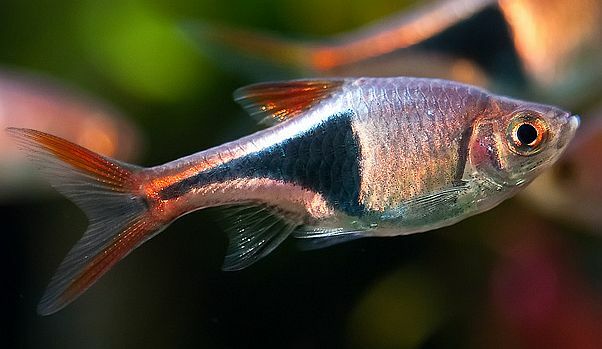 Few aquarium fish are as peaceful, resilient, and easily maintained as the rasboras however, some of the species are difficult to acclimate and maintain. Wild caught rasboras frequently display “white spot” or “velvet” disease which develops with improper handling during collection and delivery to wholesalers and ultimately, the retailer. Both diseases are easily treated but it’s a good idea to quarantine newly acquired specimens before adding them to an established community tank. 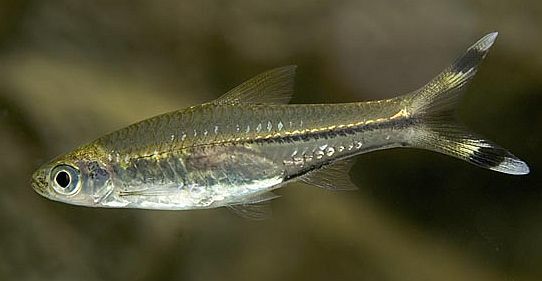 In general Rasboras are extremely resilient, but some species are adversely affected by drastic changes in water chemistry which can be demonstrated by clamped fins, emaciation, or sickly looking fish. This usually occurs with uncommon species of wild caught rasboras. New fish should be full bodied, eating, alert, and healthy looking. Rasboras are prolific breeders when a compatible pair is identified and placed in a suitable environment. Although water chemistry varies according to the locale of the wild caught fish; generally soft, slightly acidic water with fine leaved aquatic plants in the tank is all that is needed to get a pair to spawn. Condition the pair by feeding them live foods such as brine shrimp or daphnia . 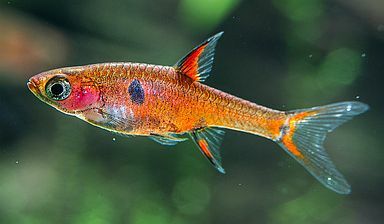 Most Rasboras will scatter their adhesive eggs over fine leaved plants but some species such as the Harlequin Rasbora (Rasbora heteromorpha) deposit their eggs under broad leafed plants in batches over a period of several hours. Hatching time varies but is usually relatively short (8 to 24 hours). After the egg sacs are absorbed (12 to 24 hours) the fry grow rapidly when provided with infusoria, baby brine shrimp , finely crushed flake food and daphnia . Because most captive rasboras are housed in a community aquarium environment with other diverse companions, they are usually fed a quality flake food however, they do better with a varied diet that includes live, freeze dried or frozen bloodworms, tubifex , or brine shrimp. 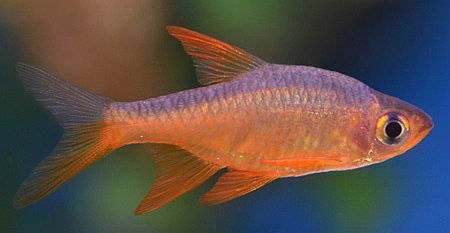 Some of the rasbora species more commonly available from retailers to tropical fish keeping enthusiasts and are pictured below, along with a list of the 83 currently recognized species.